The scene at the darkened bar looks just like a snapshot from a junior high dance. Men perch silently on barstools, their backs turned to the women nearby. Three feet away stand women chatting anxiously in groups of twos and threes, stealing quick glances at the men. Crossing the gender line is rare, and those who venture across do so with nervous smiles, quick glances and long gazes at their shoes. But this isn't a night to be shy. In fact, all of the patrons have paid for a chance to mingle and a shot at romance. Tuesday: 6:15 p.m. for ages 35-49, 8:30 p.m. for ages 25-37, at Solaris Restaurant, 125 Summit Ave.
Sept. 20: 6:15 p.m. for ages 38-50, 8:30 p.m. for ages 28-40, at Ashford Suites Hotel, 3901 Sedgebrook St. They are here to PreDate. In a world where workdays stretch upward of 10 hours and the club scene has become a tangle of mixed messages, PreDating attracts those interested in relationships but without the time or patience to endure countless dates. It also appeals to singles who have recently ended marriages or long-term relationships by providing a ready pool of prospects. Participants meet up to 12 people in one night through a series of six-minute minidates. After each date, they note whether they want to meet again; people with mutual matches receive an e-mail with contact information. Organizers tout the events as a way to save valuable time (and money) that otherwise might be blown on people who aren't — shall we say — relationship material. Clearly, this isn't your mother's dating scene. As the PreDaters nurse cocktails and ice water, Daniel Richardson darts about in Cafe Pasta's second-floor dining room, preparing for Greensboro's second PreDating event. He carefully numbers tables one through 14, placing clipboards and pencils at each pink-upholstered seat. This is the first of two PreDating events he'll host tonight. The first is for people in their 30 and 40s. Two hours later, he'll play Cupid for singles in their 20s and 30s. Fifteen minutes before the first round of schmoozing starts, Vinny Roccapriore, 38, a service technician who lives in Greensboro, leans against the bar and jokes with a friend. "I'm here because my neighbor read an article about this," he said, taking a sip of red wine. "I guess she thought I needed to meet someone." This isn't the first time Roccapriore's neighbor has taken an interest in his romantic life. "She had her granddaughter find someone who was single just so she could set me up," he said with a laugh. Roccapriore has never been married, but he has been in long-term relationships and says that's what he's looking for. "I wouldn't mind meeting someone who has kids," he said. "There are lots of families in Greensboro, and that's great, but it's almost as if I moved here too prematurely." Across the bar, Michele Thornton, a divorced mother of three, sips a vodka cranberry. "I'm here because there's no way to meet single men," said Thornton, 39, who works for Sara Lee in Winston-Salem. Like most of the participants, this is her first go at speed dating, but she has seen it in movies and read about it in e-mails. Thornton also wants to meet someone interested in a relationship, and she has prepared a list of questions for her dates in case the conversation lags. Most are basic queries about career and interests; other are deal breakers. No dice. Thornton has three. As the participants drain their drinks, name tags are passed out, and everyone ascends to the second floor. It's broiling despite the air conditioner's best efforts, and spicy aftershave and floral perfume mix freely with an underlying scent of body odor. With little fanfare, participants take their assigned seats. The tables are crowded together, with barely enough room between chairs. There's nothing on the tabletops except for a wooden clipboard, sheets of paper and No. 2 pencils reminiscent of test taking and elementary school. The women will stay at the same table for the next two and a half hours, while the men will rotate around the room. After a few instructions from Richardson — and another round of drinks, mostly water this time — they're off. One woman treats her dates like a job interview, peppering them with questions. "But I didn't even learn anything about you," one of her dates protests as time runs out. "That's OK," she replies with a sly smile. "Don't worry about it." A kitchen timer counts down the 360 seconds, and the daters shift as the shrill alarm sounds. Roccapriore is surprisingly relaxed in his olive-green khakis and blue button-up. After a few rounds, he gets a short break. "I was looking at the clock earlier today going, 'Uh-oh,' " he said. "I was really thinking about not coming. I was afraid it'd be really quiet and awkward." So far, Roccapriore said, he has been surprised at how easy it is to talk to people. "You know, I haven't had one (date) that was really weird or out there," he said. "I think the key is to have fun with it; I don't expect to meet my wife or anything." Across the room, Thornton is deep in conversation. Elbows propped on the table, she chats effortlessly with a man in business attire. She won't get much of a break. Even at the halfway point, when many patrons bolt for the bar or the restroom, she stays behind to talk. After 10 minutes, the speed daters return to their seats; some grab breath mints from a readily available stash on a table or refill their water glasses. Maybe it's the alcohol, or maybe they've just loosened up, but the daters are a bit livelier this time around. Whatever the case, the room has cooled down, and Richardson quickly resets the kitchen timer for the next round of PreDating. There are seven minidates left. Although the mood is light, many of the daters are in their late 30s and 40s and are here because their marriages fell apart or long-term relationships lost their spark. For some, this is their first foray into dating after 20 years of monogamy. "I'm a little fussy, a little picky about who I want to date," Roccapriore said. "And I think that's OK. I know what I want, and at this point, I don't want to settle." As the daters make their way around the room, some are a bit surprised who they see. Several use online dating services and have actually been talking to each other. "See that woman over there?" one man said with a laugh. "We've been talking on Cupid.com, and she told me she wouldn't be around tonight because she had a meeting." As the two-hour mark approaches, the daters are only a few tables away from their original seats. Downstairs, a fresh crop of PreDaters awaits. Most PreDating events are two-parters to provide a varied age range. The new batch is younger (in their 20s and 30s) and more casual than the first group — they're wearing flip-flops instead of heels and loafers. Allison Clark, 27, a petite brunette is decked out in black pants and a black and white silky top. She came with a few friends and figured she'd give speed dating a shot. "It's hard to meet men in this town, especially in my field," said Clark, who works at a retirement community. A few feet away, a sociable blond, Nan Robbins, 29, is ready to get going. She's not as nervous as other participants; she has already tried this rapid-fire version of dating. "A radio station did it once, and I tried it then," she said. "It was just kind of fun, especially if you don't take it to seriously. But it's true, it really is hard to meet people in Greensboro." Most of the men are reluctant to talk. They're too engrossed in the "World Series of Poker" on ESPN. As the younger set slurps drinks, the PreDaters upstairs hear the final buzz of the alarm. They fill out match sheets, specifying who they'd like to see again. And then they're done. Some head to the bar for a drink, but most go home, exhausted after a nearly three-hour dating session. "I think it went well," Thornton said. "I met a few people I'd like to see again, and the conversation went well. I didn't even have to use the list of questions in my purse." A few days later, she and Roccapriore are both happy about how things turned out. "It's not like I met the love of my life in six minutes," Thornton said. "But I got two out of my three matches, and I've e-mailed with them." Thornton even made plans to meet one of her matches for drinks. Roccapriore has been e-mailing one of his matches, but they haven't made any plans to meet yet. "It's been kind of neat to track and talk about with my friend," he said. "Saying I tried speed dating has been a good conversation starter." 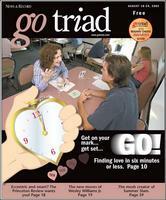 Speed dating works well across the country, and it also works well in Greensboro. I think part of the success has to do with the time pressure people feel these days. They just don't have enough hours in the day to accomplish everything. "And while social lives are important, sometimes they just get brushed aside. We offer people a solution to that. They can meet anywhere from 10 to 15 people in a two-hour period in a comfortable and efficient way. "One thing I really like about it is we're offering people another alternative in their dating lives. We're not saying give up the bar scene, we're not saying giving up meeting people through your friends, and we're certainly not saying give up meeting people at church. We're just saying this is another option when it comes to the dating scene. It's just a terrific and wonderful opportunity."